Power Ten, Inc. has partnered with Terragon Environmental Technologies to offer a unique tool for waste management, sustainability, and energy savings to the US DoD and government markets. 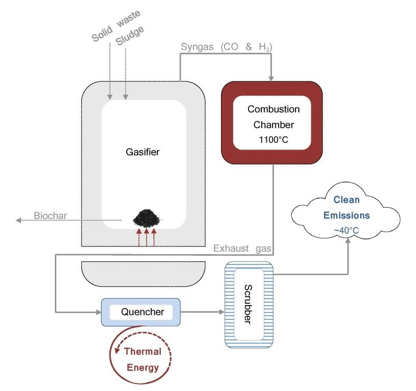 The Micro Auto Gasification System (MAGS™) is an appliance supporting the dual goals of waste destruction and resource recovery critical to sustainable environments and efficient operations. MAGS enables the local treatment of waste, as close to the point of production as feasible, while recovering energy resources in an environmentally sound manner. 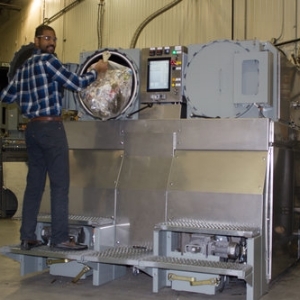 In one day a single MAGS can process one ton of “as received” organic waste, reducing its volume by up to 95%, harvesting the valuable thermal energy contained within, and eliminating the negative impact of transportation, land filling, and incineration. In addition to typical organic solid waste, MAGS destroys medical and infectious wastes, pharmaceuticals, food waste, plastic media, as well as a range of oily wastes. MAGS is ideally suited for remote, isolated, or temporary work sites, hospitals, ships, military operations, disaster relief, or anywhere there is a desire or requirement to treat waste locally. MAGS supports strategies for reducing green house gasses (GHG), energy use, the environmental impact of humans, and the management, security, and transportation issues related to military expeditionary wastes and special wastes such as contraband, classified, or international waste. Green House Gasses reduced – Organic waste in a landfill decomposes to methane, a green house gas 20 times more potent than carbon dioxide, the most often referenced GHG. For every ton of waste treated in MAGS, the equivalent of two tons of carbon dioxide GHG is avoided. Use of Fossil Fuel reduced – Treating waste locally with MAGS eliminates or greatly reduces fuel use associated with transportation of waste as well as the energy used in conventional incineration processes. Four times net energy positive, the thermal output from MAGS can offset fossil fuels used in hot water and HVAC systems. Reducing health impacts due to exposure to hazardous gasses, and particulate matter from trucks and incinerators – MAGS sequesters the carbon from the waste and has negligible gaseous emissions. There is no smoke plume or odor. Solid Waste is minimized and optimally managed – MAGS processes waste as received without the need for storage and provides a 95% reduction by volume. 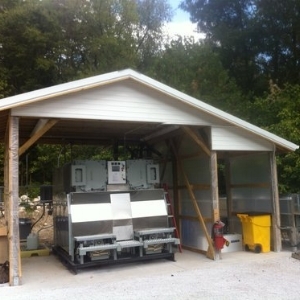 MAGS processes general organic waste, food waste, and medical waste on-site, efficiently, as it is generated. MAGS delivers excellent economics across the total life cycle of waste management through the cost avoidance of transportation, storage, security, handling costs, and fuel use. Recovered energy resources offset energy use for HVAC, hot water, or industrial processes. Integrating MAGS into a waste recovery and energy management scheme can also significantly reduce manpower dedicated to waste handling and reduce energy costs associated with the transportation of solid waste. Navigate to one of the common use cases below or continue scrolling to the "How MAGS works" section. Packaged in two TRICON containers and moved by common materiel handling equipment, MAGS features quick set up and strike times, safe emissions, no visual signatures and is many times more energy efficient than incinerators. MAGS is ideal for use in the full range of military expeditionary and civil remote operations. Integrated into a facility's energy systems, MAGS provides the basis for the immediate recovery of energy lost in what used to be considered a "waste stream." MAGS provides thermal energy for HVAC or industrial processes while greatly improving waste diversion rates. MAGS excels with specialty waste streams such as waste oils and sludge, contaminated packaging, contraband, classified and medical wastes. MAGS can convert the most cost intensive waste streams into valuable energy and avoid long term storage, shipping, and disposal costs. MAGS uses Terragon’s patented technology, Micro Auto Gasification, to thermally break down waste and transform it into a solid carbon material (bio-char) and a synthesis gas (syngas). The syngas becomes the main fuel source for MAGS, which eliminates the need for external energy sources and renders the appliance virtually self-sustainable. Put simply, MAGS gasifies - or “cooks” - waste, reducing it by more than 95 percent in volume to bio-char and a hot gas (syngas). The hot gas re-circulates through the appliance to maintain the elevated temperature needed to continue the gasification process, hence Auto Gasification. MAGS was developed and tested over the past 10 years with support from the US Office of Naval Research, the Canadian Navy and Sustainable Development Technology Canada. MAGS uses Terragon’s patented technology, the Auto Gasification Process, to thermally break down hydrocarbons in waste and transform them into a small volume (5%) of harmless residue (bio-char) and energy. In MAGS, the syngas becomes the main fuel, thus minimizing the need for external fuel sources and rendering the appliance virtually self-sustainable. Efficient combustion of the syngas is accomplished in a combustion chamber operating at 1,100°C (2,012°F), under controlled temperature and airflow conditions. Once the hot exhaust gases transfer energy to the gasifiers, they are quenched with water to a temperature of less than 80°C (176°F), eliminating the potential for the formation of dioxins and furans and then cleaned to remove particulates and acid gases prior to discharge. The emissions generated by MAGS are clear, odorless, and meet the most stringent land and sea based regulations. All surfaces and discharges are safe for the operator, eliminating health and safety concerns typically associated with waste treatment onboard. MAGS units are currently operating in a number of sites, including commercial ships, Arctic communities and industrial facilities. Didn't find what you are looking for? Use the search bar below or contact us at info@sustainedturn.com for more information.